After being a resident of Chicago for about a month now, I have two questions: when does the time come when I stop using my phone to find my way around and when do I start going to Navy Pier as a native, instead of a tourist? 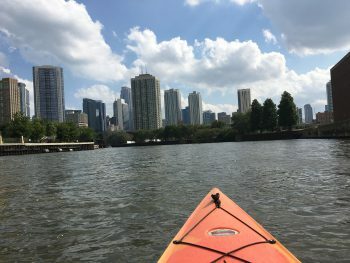 Since being in the city, I have fallen in love with so many things: like kayaking down the Chicago River or being able to see a little bit of Lake Michigan from my apartment window. It has just been thirty days but I feel like I’ve been here for years with how much I have experienced! My first week in Chicago brought on a lot of confusion. I couldn’t go anywhere by myself without getting turned around; usually when I did get turned around it was because I couldn’t figure out how to read the map on my phone. During orientation, we had time to find our ways to our internships. Before I moved to the city, I saw that it would take me an hour to get from my apartment to my internship in Evanston. Not only would it take me an hour, but I also had to transfer lines between the trains. This stressed me out so much. Although, after taking the train to and from Evanston I have noticed I don’t mind the commute. It gives me time to collect my thoughts before I get to work and after I leave. Speaking of my internship, I love it! I am interning at Rice Child + Family Center. Rice is a residential treatment home where about 40 children currently live. I’m assigned to a unit with 8 kids. One of the main focuses at Rice is to build relationships with the kids. Building relationships with the kids has, by far, been my favorite part of my internship but it might also be one of the harder things to do depending how the child is doing each day and how willing they are to talk to me. Usually, if they don’t want to talk right way, I give them their space and eventually they talk to me. I’ve gotten to know about 5 of the 8 kids pretty well so far! When it’s time for me to leave at the end of the day, it’s a pretty bittersweet feeling; I wish I could stay at Rice all day. As much as I love Rice, my life outside of work is going well too! I have spent most weekends exploring the city. Navy Pier and Lincoln Park Zoo have probably been my favorites so far. 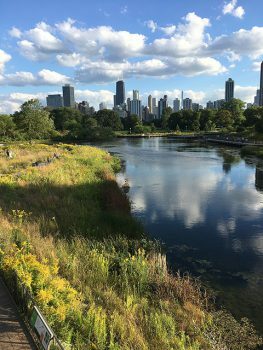 I think anywhere I go in Chicago there is usually a good view of the city, but the best view is at Lincoln Park. As you walk into the zoo, there is this bridge with a view that overlooks the water, trees and has the city as the backdrop. I love going to the zoo just to see this view! The month of September has passed so quickly; I can’t wait to see how the rest of my time as an intern will turn out. After talking to a few people I realize using your phone as a map isn’t a bad thing; everyone gets lost and needs a refresher. As much as I love Navy Pier, I realize it isn’t just a tourist stop, but a place for people to go and hang out, native or not. I plan to continue to fall in love with places in Chicago. A piece of advice for people who may be thinking about moving to the city, remember you have to be a beginner before you can be an expert.